For those who have multiple imperfections hurting the appearance of their smiles, there’s now an easy and effective way to cover the flaws for a more radiant smile. Porcelain veneers are a popular form of cosmetic dentistry because they are effective for hiding numerous imperfections while creating a natural-looking smile through a simple procedure. Dr. Byron McKnight provides custom-made porcelain veneers in Mesquite to give you an attractive new smile. Porcelain veneers are very thin false fronts that are bonded to the front side of the teeth to give the teeth a more attractive appearance. Unlike other forms of dental veneers, veneers made of porcelain are thinner, so less of the tooth structure has to be removed during the bonding process. In addition, porcelain is very similar to enamel so you’ll have a more natural-looking smile when compared to other veneer materials. 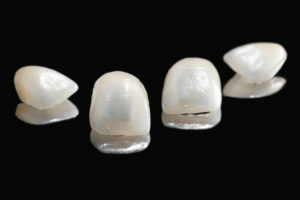 Porcelain veneers are very versatile. Veneers are effective for fixing teeth that have become chipped or cracked. Overall, veneers give the teeth a shapelier appearance, making them the perfection option for those who have shorter than normal teeth or abnormally shaped teeth. In addition, veneers can be used to hide tough discoloration that can’t be removed with professional whitening treatments. In some cases, you can use veneers as an alternative to orthodontic treatments. Those who have minor gaps, overcrowding, or crooked teeth may be able to use veneers to make the teeth appear straighter. If you’re interested in transforming your smile with porcelain veneers, you’ll first need to visit your cosmetic dentist in Mesquite. Dr. Byron McKnight will evaluate your smile and oral health to determine if veneers are right for you. If you’re a candidate for veneers, we will create a customized treatment plan to give you a new smile. To receive veneers, we will first thoroughly clean your teeth. Then, we will lightly etch the surface of your teeth to allow for a stronger bond. We will then take images and impressions, which are sent to a dental lab to create your custom veneers. While you wait for your veneers to be made, we will attach temporary veneers. After your new veneers are ready, we simply remove the temporary veneers and attach your custom porcelain veneers. The entire procedure is very simple and safe. You’ll experience little to no discomfort or pain– both during and after the procedure. After your procedure, you’ll need to properly care for your veneers to ensure the longevity of the veneers before needing replacement. With the right care, your veneers will last an average of 10 years. If you’re suffering from a less than perfect smile, don’t let imperfections damage your confidence any longer. Dr. McKnight will perform a consultation to see if porcelain veneers in Mesquite are right for you. He’ll create the customized treatment plan you need to get a radiant new smile. If you’re interested in a smile transformation with porcelain veneers, call (972) 426-9469.